You HAVE to select a job to stop (or start) first. I did click on it first which didn't work. In the end, right-clicking made the button active. The image I posted shows the torrent IS selected. Not sure if this has been reported already, but a quick thread search didn't reveal a hit. uTorrent is no longer asking me where I want to save my downloads. It is defaulting to my Downloads directory, despite me not having this selected in the settings. Win 7 64 Bit and v3.4 latest build. And; Do you have the "[ ] Use Label and Directory Rules" selected? I've just upgraded to build 30366 and the issue is still there. Use label and Directory Rules is not ticked. It's good here. Pref->UI->show options to change the name and location = checked? Well this is embarrassing :/ - Thanks Rafi! I didn't even know that option existed. No idea how it came unticked???? In latest build, what does Unlock Torrent do? [2013-11-30 05:53:19] UPnP: Device error "http://192.168.1.250:2869/upnphost/udhisapi.dll?content=uuid:6ab31de8-2082-4639-943e-4d6b2d3e2cd6": (-2)"
*Build 30366= Still No UTP transfers when seeding! Why? The icon for both is the accepted 'standard' for "Information" and the "Updates" tab is informational. If you're going to use this type of language you better get the Banned username/ip correct!!! 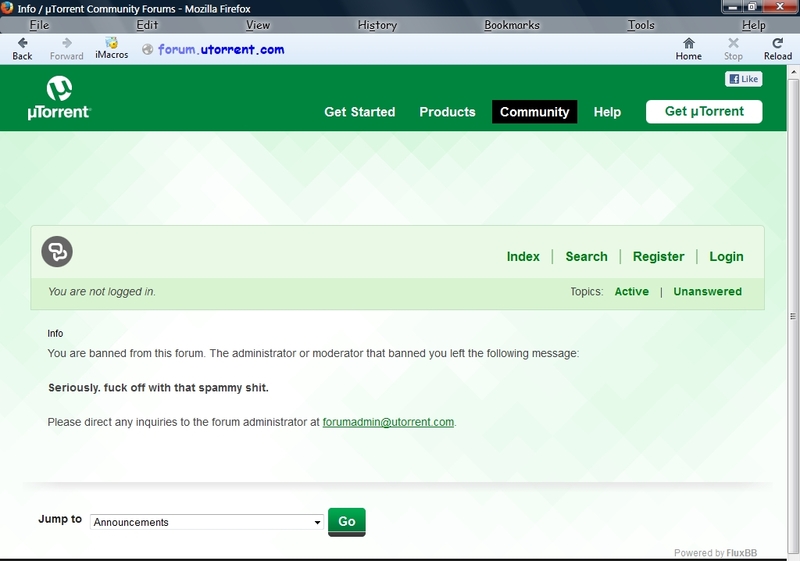 that's a forum bug, not us banning you. I'm also getting crashes with RSS feeds. I have the dumps and my appdata folder ready to submit. I'm with build 30362 and still have a problem with speed shown correctly. It shows half the speed I'm downloading with. This is on the second PC that i tried. It is with fresh win 7 and Utorrent install. My max speed is 75 Mbps witch is around 9 MiB/s. Hi - please upload your dumps, and we will take a look.